(Phys.org)—The presence of quantum coherence in photosynthesis in plants, bacteria and marine algae at ambient temperatures is well-established. Two such effects that appeared to be unrelated – enhanced solar cell efficiency and population oscillations in photosynthetic antennae – have been detected in natural and artificial light-harvesting systems. Recently, however, scientists at Texas A&M University and University of California-Irvine have shown that these effects are, in fact, deeply connected: Both arise from the same population–coherence coupling term that is noise-induced and does not require coherent light – meaning that these effects will take place under the incoherent conditions of natural solar excitation. By focusing on the fact that charge separation in light-harvesting complexes occurs in a pair of tightly coupled chlorophylls (the so-called "special pair") at the core of plant, bacteria and algae photosynthetic reaction centers (RCs), and using an analogy between the energy level schemes of the core of the reaction center (including the special pair) and those of the laser/photocell quantum heat engines (QHEs), the scientists were able to demonstrate that both effects operate as QHEs that convert solar photon energy into useful work. The scientists predict that when coexisting they can potentially increase charge separation yield by 27%, and conclude that their findings suggest the viability of artificial solar energy devices based on biomimetic quantum heat engine architectures. Dr. Konstantin E. Dorfman and Dr. Dmitri V. Voronine discuss the challenges they and their colleagues – Prof. Shaul Mukamel and Prof. Marlan O. Scully – faced in conducting their research. "Quantum effects in biology have been a hot research topic since the discovery of long-lived quantum coherence in pioneering studies by Graham Fleming," Dorfman tells Phys.org, "who used ultrafast lasers to perform coherent two-dimensional spectroscopy." He acknowledges, however, that the effect of quantum coherence on the photosynthetic light-harvesting efficiency under natural conditions is, in his words, a highly-debated issue. "In our paper," Dorfman continues, "we provide this insight by viewing the photosynthetic reaction center as a quantum heat engine. We extend our previous theory of quantum energy transport (which has recently found agreement with an experiment from Greg Engel's group1) to electron transport. We prove that the coherence-population coupling mechanism, which leads to the observed population oscillations, is also responsible for the quantum electron transport yield enhancement." Of great importance is that the researchers explain the origin of these quantum effects in biology without requiring lasers as noise-induced quantum coherence. By forming analogies with other quantum heat engines, such as lasers and solar cells, allowed the team to use their previously developed analysis to better understand the structure and function of the reaction center. "Enhanced solar cell efficiency and population oscillations in photosynthetic complexes," Voronine notes, "have until recently been the focus of two different research communities – that is, quantum optics and biophysics, respectively." He stresses that there is a large gap between these two approaches, because quantum optics is usually applied to simple isolated systems, while biology deals with very complex so-called "wet, warm and noisy" systems in which, Voronine points out, decoherence is large and quantum effects are negligible. "Population oscillations provide direct evidence of quantum effects, but it's not easy to determine their role in enhancing light-harvesting efficiency." The scientists made the connection between the two effects by realizing the analogies between solar cells and quantum heat engines, which enabled them to modify parameters and, in so doing, find biological regimes where both effects were present. In terms of noise-induced coherence, Dorfman points out that the phenomena have been known since the early 1960s2. "This coherence effect, arising from nonclassical interference between several absorption/emission pathways, has been demonstrated in many quantum systems in gaseous, liquid and solid phase. In particular, excited quantum systems can undergo a spontaneous creation of a macroscopic dipole moment due to vacuum fluctuations that results in the asymmetric emission profile." In fact, this effect found a significant application in laser physics, where it allowed lasing without population inversion that can suppress absorption while keeping emission intact3. "In our earlier work," adds Dorfman, "we demonstrated that this effect can also enhance the absorption of sunlight, which found its application in photovoltaic and solar cells4. Similar to solar cells, photosynthesis utilizes incoherent solar light and we showed the manifestation of the noise-induced coherence in such a system." 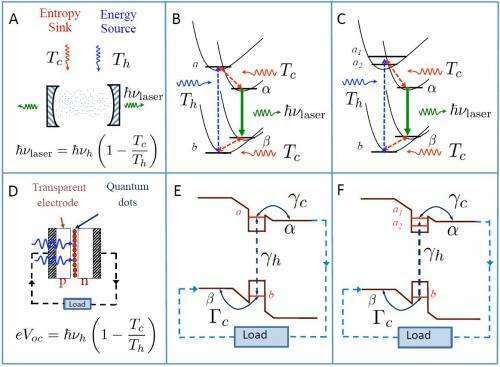 "After the original paper by Professor Scully5 on enhancing efficiency of photocell quantum heat engines, the question was how to get more extra work," Voronine explains. "It takes energy to generate quantum coherence that is used to enhance the efficiency. However, noise-induced quantum coherence appears spontaneously and does not require extra work or coherent light. Rather, such coherence may be generated under the natural conditions of sunlight and therefore it is more suitable to describe photosynthetic processes." Again, Voronine stresses that this connection emerges from the application of quantum optics to photosynthesis. Addressing the analogy between the energy level schemes of pairs of tightly coupled chlorophylls and of the laser/photocell quantum heat engines, says Dorfman, the team's reaction center model includes a pair of strongly-coupled donor molecules and an acceptor molecule. "Each molecule is treated as a two-level system that is capable of absorbing the relevant part of the solar spectrum," he continues. "When two identical molecules are strongly coupled, the effective dipole-dipole interaction effectively splits shifts the excited states. Therefore, such system can, on the one hand. effectively absorb more light due to two absorption channels, and utilize the noise-induced coherence due to closely-spaced excited states on the other. The corresponding photovoltaic cell model with an array of three-level quantum dots has two closely spaced levels in the conduction band and one level in the valence band." Dorfman also notes that excited state doublets can be produced, for example, if two quantum wells are separated by a thin barrier and the eigenstates split due to electron tunneling between adjacent wells. "Therefore," he points out, "the tunneling in quantum dot system plays the same role as dipole-dipole interaction in molecular aggregate system." "After the analogy between the enhanced solar cell efficiency and population oscillations had been realized based on the unified theoretical formalism," Voronine says, "we started searching for a suitable biological system and a quantum heat engine. The photosynthetic complex in which the coherence effects were discovered by Fleming is a complicated antenna system. Hence, we chose a simpler system - the reaction center." The five-level quantum heat engine model previously used for lasers and solar cells was an excellent description of that system. 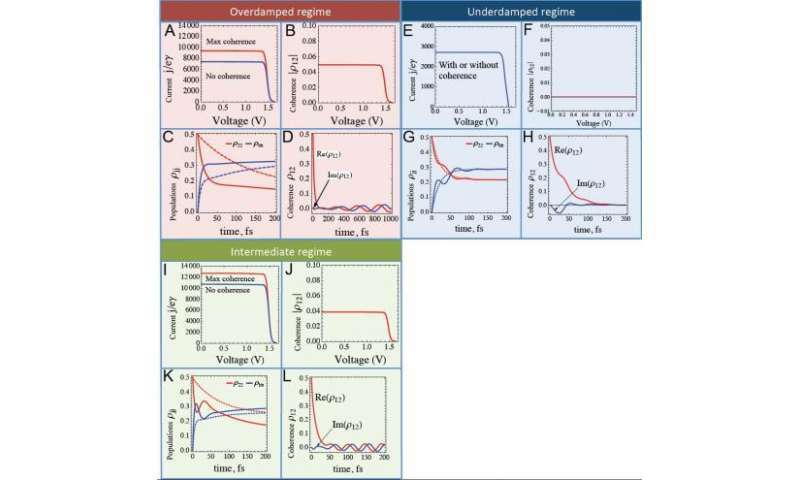 In their work, the researchers show that the coherence-population coupling mechanism that was verified experimentally by ultrafast optics in photosynthetic complexes is also responsible for the electron transport yield enhancement. "We find that the special pair of chlorophylls in a reaction center has favorable parameters to take advantage of this effect," says Dorfman. "We analyzed three regimes that contain a set of parameters representing various reaction centers, as well as a broad range of excitation light parameters." These regimes can be understood through a simple analogy with harmonic oscillators in over-damped and under-damped regimes. "It's remarkable that both effects are caused by the same mechanism of noise-induced coherence but realized for different parameters," Dorfman points out. "Thus, the interplay between spectral and temporal parameters of the excitation light and system allows us to observe population oscillation and/or enhanced yield within the same model." Approaching this study required insight and innovation. "Energy and electron transfer are the two major processes responsible for the life on Earth," states Dorfman. "They're used in photosynthetic reaction center to convert energy of the sunlight into useful work in a form of electric charge – and algae, bacteria and plants have been optimized by evolution to harvest this energy with high efficiency. At the same time, solar cell technology has been addressing the question of high efficiency solar cell for decades." Understanding the limitations and underlying mechanisms of light harvesting in semiconductor photovoltaic cells allowed the scientists to use, as Dorfman says, "weird" quantum mechanical effects, previously discovered in lasers, in photosynthesis under incoherent sunlight excitation. "For the first time," he stresses, "we described photosynthetic organisms as heat engines with the ability to use quantum effects to boost their efficiency beyond classical expectations." The bottom line: Quantum effects manifest themselves under natural conditions of light from the sun and require no lasers. Voronine also notes that the researchers revisited the well-known theoretical formalism of quantum optics and provided a new interpretation of several terms in quantum master equations. "These terms connect various classical and quantum variables such as populations and coherences," he explains. "They're responsible for enhancing efficiency and may be observed in experiments that show oscillations. Our main insight was a connection between these two previously unconnected physical phenomena – but other breakthrough insights were the connection between the structure of biological complexes and quantum heat engines, as well as noise-induced quantum coherence effects in photosynthesis." Dorfman explains their prediction of an enhanced yield of 27% in a QHE motivated by the photosynthetic reaction center to Phys.org. "The precise quantitative enhancement of the yield is based on the broad range of the system and light source parameters. Theoretically, the model can predict up to a 50% enhancement of the yield in a different parameter regime – one that's rarely realized in photosynthetic organisms. However, artificial light harvesting – in for example, organic photocells – can be a key to transfer the principles of the natural complexes to artificial devices." "From the evolutionary point of view," Voronine adds, "even a small increase in efficiency could have dramatic consequences for the survival of organisms in extreme conditions, such as photosynthetic bacteria in hydrothermal vents." In concluding that their findings imply the utility of biomimetic artificial solar energy devices, Dorfman points to recent progress in organic photovoltaic devices suggesting that it is a very promising direction in solar cell technology. "The advantage of using organic materials is their low price and easy fabrication compared to, for example, crystalline silicon based semiconductor solar cells," Dorfman explains. "In contrast with semiconductor based photovoltaic cells where the charge separation occurs in the p-n junction of the bulk semiconductor material the principles of organic solar cells are closely related to photosynthetic light harvesting. Both involve a donor-acceptor molecule where the primary charge separation occurs." The current technological problem is twofold: low exciton transport efficiency and rapid degradation. (An exciton is a bound state of an electron and hole attracted to each other by the electrostatic Coulomb force.) While natural light harvesting in plants, bacteria and algae operates at nearly unit transport efficiency, reaction center efficiency is quite low. "Noise-induced quantum coherence, on the other hand, provides a new insight into the power efficiency of charge separation, which can be combined with high transport efficiency in organic materials," says Dorfman. The team's research findings may also improve thermionic conversion – another approach to, among other applications, increasing photovoltaic yield. "Thermionic conversion addresses the electrical and thermal properties of nanostructured materials," says Dorfman. "It governs a multistage energy conversion process. Our approach can benefit one or more element in possible heat-to-electricity conversion by enhancing light absorption." Voronine points out that their approach differs from quantum thermionic conversion in that it uses quantum coherence to suppress heat loss – but the remaining heat losses could be further converted to electricity in a photon-enhanced thermionic solar cell. "It seems possible," he agrees, "that our approach could also be applied to improving solar cell efficiency based on quantum thermionic conversion." Voronine describes other innovations the researchers might develop and apply to the current experimental design. 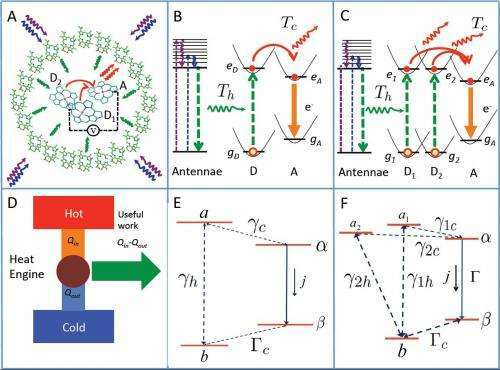 "We may design more elaborate multi-level quantum heat engines to describe other biological systems, such as photosynthetic antenna complexes. In addition, we may employ higher level of theory for a better description of the protein environment that surrounds light-absorbing molecules." In terms of the next steps in their research, Dorfman says that – given that they've demonstrated that the photosynthetic reaction center's operation can be enhanced due to quantum coherence based on a simple model that contains all the essential physical properties of the system - in the future we would like to address similar questions from the point of view of the experimental observables. "In particular," he explains, "multidimensional nonlinear optical spectroscopy has been proven to be a natural tool for studying the dynamical and static properties of the molecular systems." The scientists currently perform relevant experiments using ultrafast laser sources that are very different from the natural light harvesting. "We're therefore planning to develop both theoretical and experimental frameworks that will allow us to simulate the natural conditions of solar excitation," Dorfman adds, "and to define the observables that can be capable of testing the predictions of the present theory." Looking further afield, Dorfman notes that with their new insight into the role of quantum coherence effects in photosynthesis, the scientists envision a new approach to improve the design of light-harvesting and nanophotonic devices. "Furthermore," notes Dorfman, "our work will be of tremendous interest in the laser, photovoltaic and photosynthetic communities." "Quantum biology is still a developing field with many open questions," Voronine concludes. "Quantum information researchers may consider several biological systems as potential candidates for a quantum computer." All rights reserved. This material may not be published, broadcast, rewritten or redistributed in whole or part without the express written permission of Phys.org. Good work and good article. IMO, there is a simple and direct connection between quantum physics and quantum biology: Max Planck's quantum of energy. See, e.g., "Brain oscillations reveal that our senses do not experience the world continuously," a PhysOrg/Medical Express article dated May 14, 2012. Or see "Coupled Oscillators and Biological Synchronization," by Steve Strogatz and Ian Stewart, Scientific American Dec 1993, describing work by Art Winfree (MacArthur Prize)on a mathematical law of coupled oscillators, circa 1967. This article is available on a math.oregonstate.edu site. Winfree's mathematical "law" says that limit cycle oscillators have a tendency to couple or synchronize. The result is coherence--the phenomenon described in the above article, the brain oscillations article, and the Scientific American article. Planck's quantum of energy is a periodic oscillator, producing limit cycle oscillations. Planck plus Winfree = quantum physics, quantum bio. Macksh - Thank you for your well-informed comment, with which I couldn't agree more. *)When working at high temperature and lots of degree of freedoom, there can not be clear separate two level system, especially not in a biological and not artificial things. Or do i miss something? use it to enhance our physical or pschycological properties (e.g. natural dopings). Maybe we should start thinking about this. The pigment array in thylakoid lamellas appear pretty similar to quantum dots arrays. Each quantasome contains about 230 to 300 chlorophyll molecules. They're regularly spaced in 150 x 180 A lattice, like quantum vortices in superconductors or magnetic domains in ferromagnets. All the molecules in each of these photo-synthetic units are spaced and oriented in such a way, captured photons are transferred from molecule to molecule by inductive resonance and the energy absorbed is transferred to as exciton. Experiments have demonstrated, that the presence of the quantasome particles in chloroplast membrane is not a necessary condition for photoreduction activity of chloroplasts [J. Mol. Biol., 27, 323 (1967)] In prokaryotes pigments are distributed uniformly on or in the thylakoid lamellae, which decreases the quantum yield of photosynthesis by about 7%. BTW IMO the noise-induced quantum coherence powers the magnetic motors too. Sometimes the entropy can do usable work for us.. Excellent research article. Couple this with the article on seeing complex systems also on phys.org. This article and that are complementary.